In this probing examination of the meaning and function of culture in contemporary society, Lawrence Cahoone argues that reason itself is cultural, but no less reasonable for it. While recent political and philosophical movements have recognized that cognition, the self, and politics are embedded in culture, most fail to appreciate the deep changes in rationalism and liberal theory this implies, others leap directly into relativism, and nearly all fail to define culture. 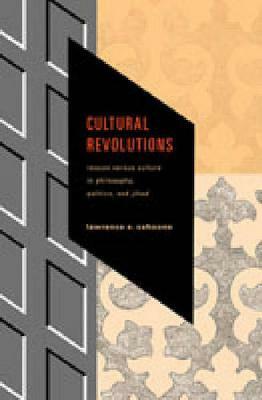 Cultural Revolutions systematically defines culture, gauges the consequences of the ineradicably cultural nature of cognition and action, yet argues that none of this implies relativism. After showing where other "new culturalists" have gone wrong, Cahoone offers his own definition of culture as teleologically organized practices, artifacts, and narratives and analyzes the notion of cultural membership in relation to race, ethnicity, and "primordialism." He provides a theory of culture's role in how we form our sense of reality and argues that the proper conception of culture dissolves "the problem" of cultural relativism. Applying this perspective to Islamic fundamentalism, Cahoone identifies its conflict with the West as representing the break between two of three historically distinctive forms of reason. Rather than being "irrational," he shows, fundamentalism embodies a rationality only recently devalued--but not entirely abandoned--by the West. The persistence of plural forms of reason suggests that modernization in various world cultures is compatible with continued, even magnified, cultural differences. "Cahoone rethinks all the basic categories of philosophy of culture in a breathtaking critical analysis of the major contending positions and articulates a clear, though complicated, new theory. It pays off brilliantly in his concluding analysis of Islam in the contentious battle of cultures (and arms). This book should be required reading not only for philosophers of culture but also for social scientists, theologians, historians, journalists, and political leaders." "In this engagingly written book, Cahoone addresses an eminently timely topic with a clearheadedness that is often lacking in such discussions. With arguments that are unfailingly provocative, he points out that acknowledging the cultural embeddedness of reason by no means requires us to accept a disabling relativism or to abandon our commitments to critical rationality and to intercultural dialogue and understanding. Meaningful forms of rationality can be salvaged in the wake of postmodernism and of the 'cultural turn, ' he argues. Through a painstaking examination of the seemingly recalcitrant case of genuine or deep cultural difference, Cahoone deftly wends his way between, on the one hand, a liberal culturalism that refuses to take seriously those differences that transgress the compass of liberalism and, on the other, a postmodernism that holds cultures to be bounded, homogenous wholes. He is led to elaborate a conception of culture that allows him to carve out a distinctive and compelling position on the vexed relationship between liberalism and cultural tradition." "In this remarkably well-written and closely argued book, Larry Cahoone offers a truly original account of the relation between culture and reason. After providing a reliable and critical analysis of the current literature on the subject, he offers an alternative theoretical perspective of his own that helps us both to understand and criticize religious, especially Islamic, fundamentalism. This important book shows how to construct a culturally sensitive but non-relativist theory of rationality."